Mughalai Paratha is popular street food in North India. 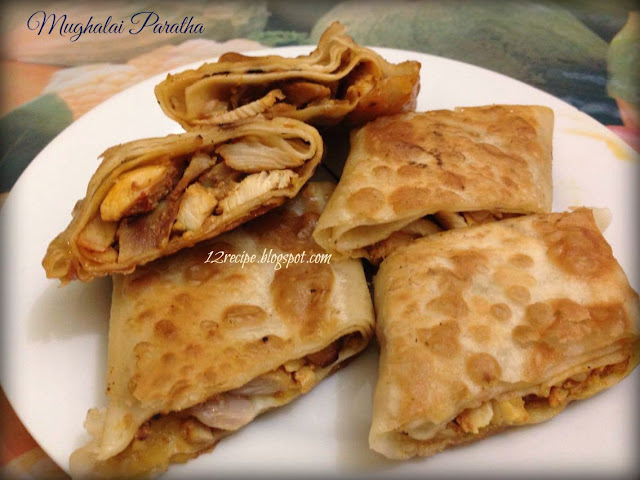 The paratha is stuffed with meat filling, onion and eggs. 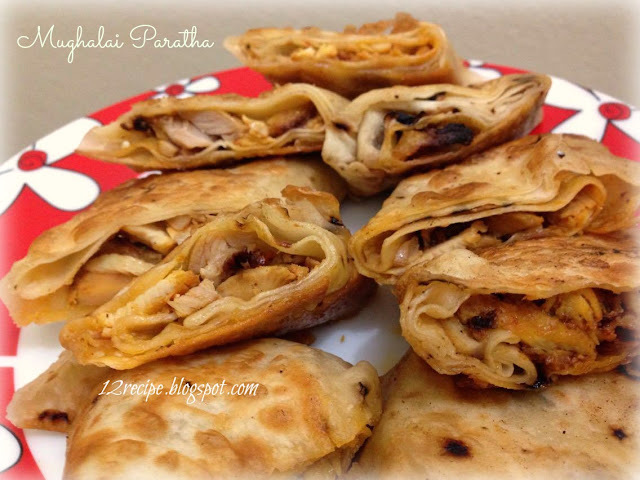 Theses absolutely delicious paratha’s are served as a breakfast or as a snack. Mix chicken pieces with soy sauce, salt, ginger garlic paste and pepper powder. Add a tablespoon of oil in a non-stick pan and shallow fry theses chicken pieces until nice golden in color and cooked. Add it in to a plate. In the same pan add onion and cabbage chopped; saute for two minutes and add it in to the chicken. Beat an egg with salt and pepper powder. Keep it aside. Mix flour with other ingredients. Add water little by little and knead in to smooth dough. Cover it with a kitchen towel and let it rest for 30 minutes. Make equal balls out of it. Roll it out in to thin (as thin as possible) roti’s by applying oil. Add a part of chicken filling on the top and add tablespoon of egg mixture over it. Now fold it like an envelope and stick the edges well. Immediately add in to the hot tawa by applying little oil. Cook on both sides in low flame until both sides are cooked and gets golden in color. If you want; cut it in to pieces and serve.